Hi there! My name is Joey, and I recently came to AGaG when my elderly companion could no longer care for me. I’m a very small nine year-old boy who weighs in at only 43 pounds! 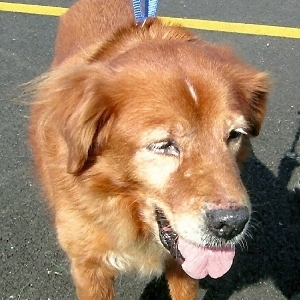 By all accounts – from my vet to my foster mom – I’m an amiable and sweet senior boy who absolutely loves attention. I have lived with dogs, cats, and teenagers, and I’ve had no problems with the children in my foster home’s neighborhood. I have a German Shepherd as a foster sibling, and we get along just fine. I’m a little slow getting up and down, but once my two daily walks begin, I’m great on a leash. My foster mom says I have a bit of a “spring in my step.” Afterward, I love to rest quietly in a crate, and everyone is still waiting for me to bark! If you’d give me a couple of daily supplements for my arthritis and a drop in my eye to keep it moist, I’d give you lots of companionship in return. So, if you think I might sound like a great match for you, give my foster mom a call. She’ll fill you in on all of my charms….and she’ll warn you that I might surprise you at how fast I can move when a bunny crosses my path!